Hi graham.. I’m glad to found this blog.. I’m now ongoing treatment for pre surgery.. ..n I would like to know how long did u wore braches before surgery? N how mm they moved ur upper n lower tooth? Fakhrul, I wore braces for 2 years before surgery and 9 months afterwards. I also had both jaws operated on. Hi! What drinks did you have the day after surgery? When did you start to blend food? Glad to hear you are doing well. Hi Eric, I just had my double jaw surgery in Calgary a few days ago. My surgeon was Dr. Edwards. I hope I was able to help you! 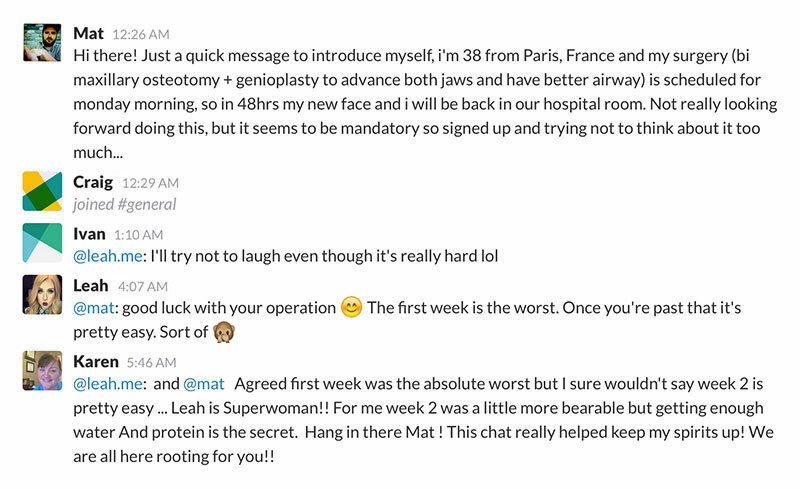 Well it has seemed like such a long time ago when they cancelled my surgery 3 months ago…and now only 4 days away. Thanks Graham for all the advice. I have read your blog so many times I think I am ready. I’m not very nervous yet, but I’m sure come Thursday evening I will be very anxious. Taking Thursday off from work to relax and enjoy the day with my hubby and to be mentally prepared. I will let you all know how everything goes. I’m so excited for you Terry! Let the adventure begin! Hi Graham: I stumbled upon your blog while doing some research for my 18 year old daughter, Jade’s double jaw surgery on Tuesday March 26th, 2013, and I am so happy that I did. You have informed us of what to expect better than any professional health care person. We have both read over your blog several times. We have picked up all the required items that you have suggested. Even the prune juice, she is not looking forward to this but it if makes her recovery easier than I’m all in. You have a delightful way of relaying the not so nice parts with humour and optimism. Although she (and I) are nervous, your blog has comforted us tremendously. I’m not sure what your career is, but you should be a writer! Thank you for everything that you have written and for checking in and answering everyones’ questions and concerns. We are in Peterborough and the costs are very similar to yours. Thanks again, and by the way you look terrific! Janet, I’m glad you and your daughter found my experience useful and comforting. If you’ve read through every post, you should have a very good idea of the longest possible recovery. Most people recovery more rapidly than I did (and hopefully Jade is one of those people!). Her operation will go swimmingly on Tuesday. Blessings to you! Thanks Graham – also have to mention a little device that was very convenient for me – Kitchenaid hand mixer – worked great – just put stuff in a cup or bowl and buzzbuzz, its ready in 20 seconds. I appreciate all of the responses – extremely informative for a surgery and recovery that can be pretty unsettling at times. Graham, do have to say that I greatly appreciate your blog. I’m especially impressed at your effort on responding over 2 years later. Im 37 yrs old, and right at 30 days from lower jaw extension (fixed class 1 overbite). They moved my lower jaw forward 5 mm. I had no bruising and limited swelling. Those worried about the IV should get the lydocaine before. It was pretty painless. I took my pain meds for maybe 3 days, but switched to ibuprofen after that. I was back in work 8 days after surgery and only managed to lose about 6-7 lbs. My favorite foods were smoothies (obviously), puree’d clam chowder, and mashed potatoes with cheese and broccoli puree’d (add sour cream after!). My biggest concern is that I still have swelling in my cheeks and along my jawline. My doctor recently told me that my swelling was nearly gone, but im really hoping it will go down further. I definitely have a bit of chipmunk cheeks!! From your blog, it really looks like this last bit of swelling really went away from day 30+. My ortho doctor said i had some lymph fluid and my buccinator was swollen still. Im just curious if you had the same experiences. By day 76, your jawline looked great. Thanks again for the blog. Definitely think your surgery turned out very well. Catherine, welcome to the other side (of the surgery, that is)! The anesthetic should be going by the end of the second day, so hopefully you’re back to normal now. As for hunger, I was honestly unable to satisfy that for at least a month. You can try blending Chunky soups to get some actual “solids” into your body, but you should probably stick to smoothies and thin soups (such as tomato) for the first couple of weeks. You’ll get through this, though. No worries! Thanks! Yeah, just trying to focus on other things now. Pretty much everyone says that it’s a rough road, but totally worth it. I suspect it’s like when I first got glasses (at age 13). I couldn’t understand what the problem was until I put on that first pair of glasses. Had no idea what I was missing. I’ve never known what it’s like to have a “normal” bite, and hope that going forward, I’ll be able to chew properly, digest better, breathe better, stop biting myself all the time, etc. Focus on the benefits, in other words. I’m so glad I found your website. (I’ve been reading some other blogs, too.) I’m 40 years old, and after seeing different orthodontists, getting second (and third, and fourth) opinions, I couldn’t get out of having upper and lower jaw surgery. My surgery will be sometime in early 2013. My upper jaw will be widened and my lower jaw moved forward to correct a Class II malocclusion. Right now, I’m honestly just scared. Terrified. Waking up every night worrying about it. I know all I can do is relax and trust the process, but it’s just hard. One of the hardest things is explaining to people that this is NOT cosmetic. Most people in my life think I’m nuts to be doing this. Thankfully, my husband saw all my diagnostics and “gets it.” My kids, who are 8 and 5, well, they’ll have to understand that Mommy will look a little…uh…weird for a month or two. Thanks for so openly documenting your journey. It makes it a little easier for the rest of us, having some idea of what to expect. I’m glad you’re finding my written experience useful. This operation is certainly a tough outcome to accept, but I promise you that it’s worthwhile. You’re still young, so you’ll heal up nicely. I met one man who underwent the surgery in his mid-sixties and still pulled through with no issues! For now, try to put it out of your mind. When next year arrives, you’ll be in good shape and the operation won’t be a problem. My turn to go in surgery tomorrow to have my bones broken, so best of luck to me! Your blog has been so informative and has helped me immensely in this long process of waiting for jaw surgery. I am extremely nervous now, but I know that it will be all for the best. Its all the tubes that they’ll be sticking into me that I’m afraid of! See you on the other side of jaw surgery! Alarice, I wish you all the best today and hope you recovery at a rapid rate! I’m actually considering traveling through Southeast Asia and making Singapore my final stop, believe it or not. You’ll even be all healed by the time I arrive! I cant begin to describe to you how helpful your site has been for me! I just had double jaw surgery on August 2nd. In my case the surgeons moved my bottom jaw back, my top jaw forward and up to hide my gummy smile, and moved my top and bottom mid line to the center since both of them were off. As Im sure you are aware, my face has undergone quite a bit of trauma over the past couple of days! I still cant eat and I’m obviously very swollen…:/ My biggest concern is that I currently weight 108 lbs and Im afraid that I’ll only lose more and more weight! What was you favorite “meal” while you were in recovery? I really like the Ensure drinks, but right now I find them to be very thick and with all the congestion that Im feeling its hard to drink them. I wouldn’t worry about your weight. People lose weight during recovery proportional to their “natural weight.” In other words, if you’re already light, you likely won’t lose much weight because your body simply won’t let you. I only lose 30 lbs because I put a bunch of weight on before surgery, so in reality, I was losing weight I wouldn’t have normally carried anyway. My favorite meal during recovery was most definitely fruit smoothies. I would blend up fruit, ice cream, yogurt, honey, peanut butter, and oatmeal—delicious! You can find my recipe here. Hey, how much for your numbness was gone by the end of month 2? How long was it till you could actually feel the majority of your chin and lower lip again? Bill, I would estimate that about 70% of my feeling had returned by the end of the second month. I could feel the majority of my chin and lips again by the end of the fourth month. Unfortunately, nerves take their sweet time healing, so they require patience. Thank you Graham for your information. My daughter will be having her surgery next week and I have been reading what you went through so I can take care of her. You have helped me so much. Always glad to help out, Trisha! Your daughter is lucky to have a mother who is educating herself on the surgery. It’s going to go forward perfectly! Hi Graham, I can’t believe that you still follow up on your followers here. I just finished your stories today. Anyway, I too has underbite and crossbite. I can’t tell how far out your underbite was you said class 3. Mine is alot more out than yours and its crossbite as well so the gab between my upper and lower are much greate on my left than my right. I just have a few questions – I’m on braces now – and I didn’t see from your history (or maybe missed it) when you begun with your surgery while on braces? how it was decided to start? I’m on braces now for 4 months and I’m supposed to get my wisdom teeth pulled. I was wondering when it will all start. Thank you again for documenting all this! You look great! I had braces for 1.5 years before surgery and then another 6 months afterwards. I had my wisdom teeth pulled approximately 1 year before the operation as well. The reason I had to wait so long before having surgery is because my orthodontist was waiting for my jaw to stop growing. Your operation will come soon enough, my friend. This process requires patience—baby steps are the key! I only took the pain medication for the first couple of weeks, so I was drug-free by the time I reached Day 19. I still found yawning to be extremely painful, and I swelled up and experienced discomfort if I spoke a lot during the day. Pain medication is for your comfort only as it does not aid in the healing process. If you’re finding the pain is making your miserable, I would ask your surgeon to prescribe you something to take care of that. I’m stubborn so I just dealt with the discomfort until it went away, but I in no way encourage you to do the same.